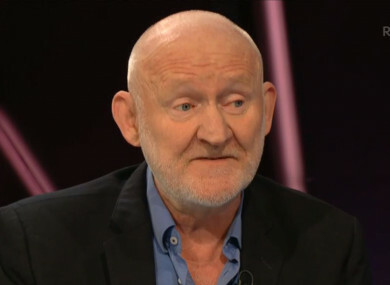 Former chair of the Housing Agency Conor Skehan made his comments on RTÉ’s Claire Byrne Live last night. THE CONTROVERSIAL FORMER chair of the Housing Agency Conor Skehan last night repeated his claim that homelessness is “normal”. Speaking on RTÉ One’s Claire Byrne Live last night, Skehan said he has been “trying for years” to get the government to “recognise and normalise the situation” in Ireland. Emergency accommodation figures for November, the latest available figures, show that there were 9,968 people living in homeless accommodation that month, an increase of 244 people on October’s figures. Meanwhile, the number of people sleeping rough in Dublin has increased to 156, according to the latest Rough Sleeper Count, which was published last month. During his time as chair of the Housing Agency, Skehan came in for heavy criticism for claiming that Ireland’s housing crisis is “completely normal” and for suggesting that some homeless families may be “gaming the system”. Speaking last night, he echoed some of his previous remarks. “We continuously allow ourselves to be goaded by people in advocacy, which in any other field would be called lobbying, into trying to ignore the fact that we have equivalent levels of homelessness, which is an incredible human tragedy, to every other major country in Europe. It’s normal,” he said. It’s normal in the sense that human beings go through many different emotional upheavals in their lives, but there are particular ones that are the equivalent of, we just talked about social media a minute ago, clickbait – the ultimate, emotional clickbait that can be stimulated in another human being is to say that somebody is without shelter. During last night’s interview, Skehan heavily criticised the homeless charity sector in Ireland. “By trying to distort ourselves into saying that we are somehow or other, as a government, not doing anything about this, or not doing enough about it, or not doing as much as can be done, that’s what’s causing resources to go to the wrong place,” he said. This, he claimed, is “what’s causing us to have a country that spends €152 million of your money every year on charities that deal with homelessness”. We need to be challenging people to say if we are giving you this amount of money, you must give us a return, you must give us a reduction in the number of people who find themselves in this situation. A number of homeless charities in Ireland receive government funding. These charities work with individuals and families who are homeless or at risk of becoming homeless to provide housing, interventions and wrap around services. Reacting to Skehan’s comments, Focus Ireland’s director of advocacy Mike Allen told TheJournal.ie “it’s hard to work out” what Skehan was trying to say. “He believes that homelessness is normal, but he doesn’t believe that having organisations to help homeless people is normal, that just doesn’t make any sense,” Allen said. “If homelessness is normal, then he should be perfectly happy to have organisations that are there to help people who are experiencing what he calls ‘a human tragedy’,” he said. In an interview with The Irish Times in January 2018, Skehan suggested that homelessness charities should be subject to “performance targets” to justify any state funding they receive. He also said that it was time to stop saying that homelessness can be ended. Speaking about these comments at the time, Allen pointed to the example of Finland – which has all but eliminated long-term homelessness – as contradicting Skehan’s claims that homelessness could not be ended. He had also said that Focus Ireland and other charities are subject to strict performance targets over a large number of their state-funded activities. During last night’s interview, Byrne suggested that charities “wouldn’t exist if there wasn’t a problem”. “Those charities who tell you that we will end homelessness are beginning their career with a lie,” he said. Byrne went on to press Skehan on what the solution is to ending homelessness and asked why it didn’t happen while he was in office. “The main thing you need to do is raise awareness about it and that’s what I spent my time in there trying to do … make sure there’s independent and authoritative advice given to government to make sure that resources go in the right direction,” he said. Email “Former top housing official claims homelessness in Ireland is 'normal' ”. Feedback on “Former top housing official claims homelessness in Ireland is 'normal' ”.